Five galactic princesses go into hiding when the evil Empress Geela invades their home planets and captures their parents. Athena, Luna, Rhea, Hera, and Juno decide they can't stand by and watch Geela destroy their homeworlds! Five awesome makeovers later, the girls form a band called SPACEPOP to spread the rebel message of freedom and resistance through music. But when the princesses are recruited as secret agents, can they keep their true identities under wraps? This adventure series will resonate with girls eight to twelve who love fashion, music, friendship, and fun! This book is the origin story to a new tween lifestyle and entertainment brand. 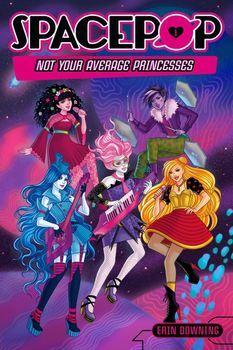 Five exiled princesses go undercover as the band SPACEPOP to take down the evil Empress Geela and save their home planets.